A member of Freo’s Next Generation Academy, Carter could become the first player from the club’s Kimberley catchment zone to graduate to the senior squad via the NAB AFL Draft. “If I were to get drafted, I’d be the first one from Wyndham. I contact my parents nearly every day and they tell me how Wyndham is very excited,” Carter told AFL.com.au. “Pretty much everywhere they go someone is asking how I am, how’s footy going and all that. It has already been a big year for Carter, who was moved to Fremantle’s WAFL-alignment outfit Peel against original club Claremont’s wishes in February in a bid to fast-track his development. 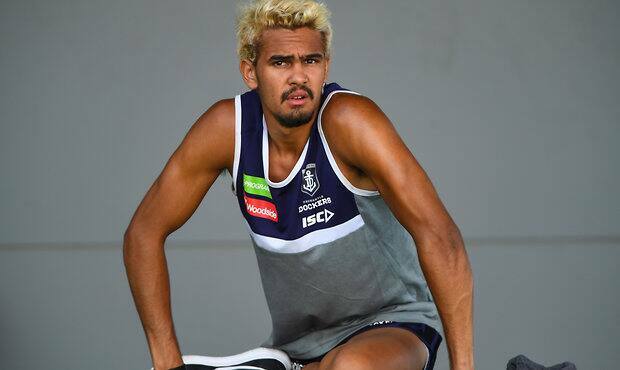 The arrangement saw the athletic 182cm wingman move in with a Dockers host family and work closely with Tendai Mzungu, who rejoined Freo from a stint at the Giants late last year to head up the club’s academy program. “He’s a good bloke and he’s awesome as a coach. He gives that insight of what it takes to be an AFL player and ways to get there,” Carter said. “Hearing stories from them and from when ‘Sonny’ (Walters) first started, the struggle he went through to what he had to do to stay on the list, he shared that with me and then guided me as well to stay on the straight and narrow path,” Carter said. His 2017 was ruined by a serious knee injury suffered in WA’s final trial match, and it took some time to adjust after returning this year at a different WAFL club. In an up-and-down campaign, he averaged nearly 16 disposals for Peel’s colts, with his 20 touches in a qualifying final loss to Swan Districts a highlight. “I thought my season was a bit on and off coming from my knee injury last year and having (almost) the whole year off. I thought I played the best I could,” Carter said. “It was a big difference going to a new club, new environment, new coaching staff, new players and being able to trust in the players and them to trust me as a player on and off the field. Blessed with pace (he ran a 2.87-second 20m sprint at the WA State Combine) and a sizeable leap (90cm running vertical jump), there is no denying Carter’s raw attributes, even if he has some rough edges to refine. “His run, speed and carry is at a high level, but he fumbles. If he can correct that, I think he can be a very good player. “He’s harder than what I thought as well. He doesn’t mind winning the contested ball and hitting some bodies, which is a good sign for a player that can run and carry like he can. “When I was little kid I watched football every weekend and kept telling my parents ‘I’m going to be on TV’, and they kept pushing me and pushing me to do my best,” he said. “They got me down to school and I spent five years at Aquinas and from year nine onwards footy started getting a bit serious.